There is a “Special Meeting” of the City Council Tuesday at 2pm — the City received a “Final Feasibility Study Report” from Brezack & Associates for the sewage plant on the golf course, and the City is trying to punch this project through as quickly as possible. Make no mistake – this is a sewage plant to process raw sewage and convert to purple pipe water to irrigate the golf course, parks and medians in town. 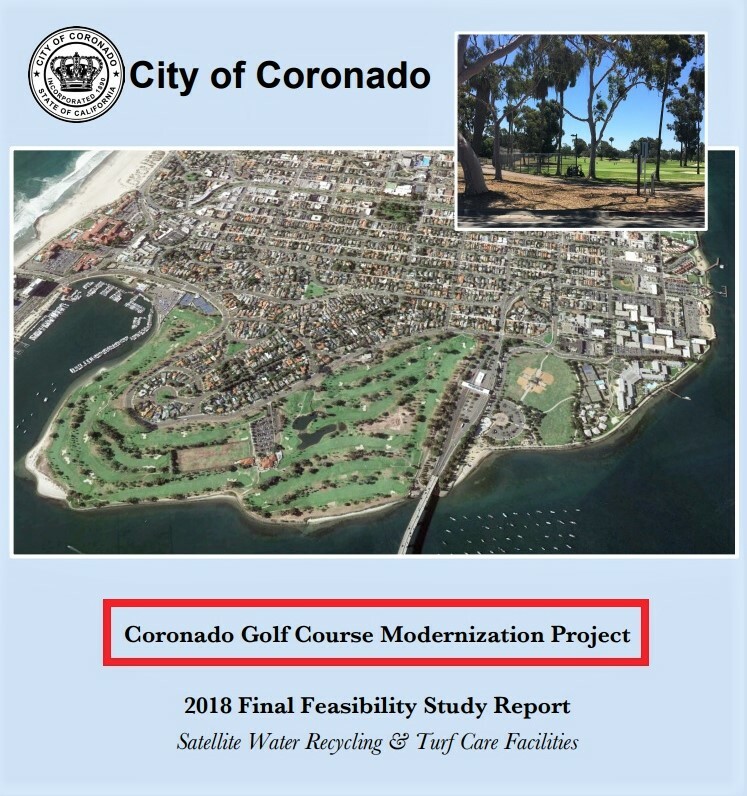 They used to call this project a “Recycled Water Treatment Plant”… they are now calling it the “Coronado Golf Course Modernization Project,” but it’s a sewage plant. Last year I called Brezack & Associates for an update on the “bridging document,” and they explained the project “hit a snag,” as the sewage water they tested in town was “too salty” (due to brackish groundwater intrusion and routine pumping of groundwater into the sewer from subterranean construction projects) – so salty, in fact, that they would need desalination to treat the sewage for purple pipe. The addition of reverse osmosis desalination to the project has raised the estimated cost of the sewage plant to $25 Million Dollars. They have already spent close to a million dollars to study the project and approved a $4M expenditure to connect sewage from the Navy Coastal Campus to the Cays Pump Station to make the sewage plant on the golf course “more viable.” The proposal includes an “option to provide an additional .25 million gallons per day at an additional construction cost of $2.5 million.” This brings us to a total of $32.5 Million Dollars so far to solve a problem that does not yet exist. The reasons set forth for doing the project now is because there has been prolonged drought in the past, and there could be drought in the future, along with the possibility of future state regulations that may require an alternative water source. However, there is no drought nor legal requirement for purple pipe in Coronado now. They are talking about financing this project in many different ways including bonds, loans, and/or from the City’s general fund. 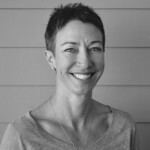 Even when completed, the project may operate at an annual deficit, with a “total expected first-year expense amount at $1.758 million (operations and maintenance of $766,000 and debt service of $992,000).” The City will try to make up this deficit through a combination of raising “green fees” (i.e., fees charged to golfers per round of play) and selling recycled water to Cal-Am Water Company. Last year I met with senior geologist at USGS Wes Danskin who has mapped the San Diego Formation aquifer, and believes the aquifer underlies the golf course. I also spoke with the man in charge of the Richard A. Reynolds Groundwater Desalination Facility across the bay in Chula Vista that is producing 10 million gallons of potable water per day by tapping the San Diego Formation aquifer. They see no reason why Coronado could not do the same for irrigation quality water. 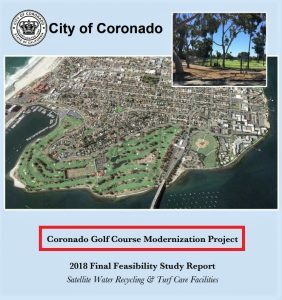 Better yet, Coronado doesn’t have to do anything whatsoever at this time – let’s shelve the project for now, save 30+ Million Dollars, and focus on more fiscally prudent ways to spend money. Click here to read whether further study is needed prior to breaking ground.